I am back with another DIY. 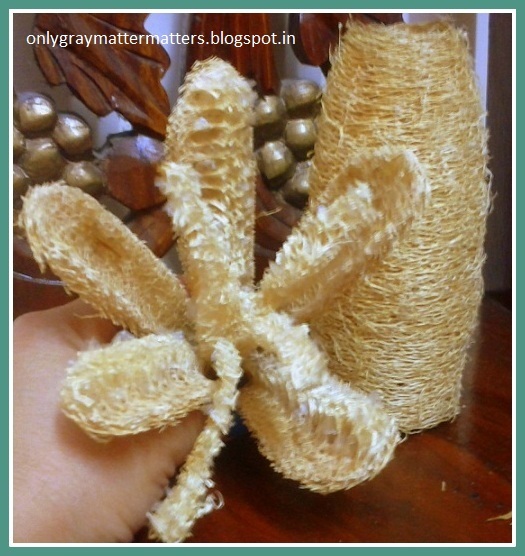 Let's learn how to make your own 100% natural loofah for exfoliating your body during bathing. 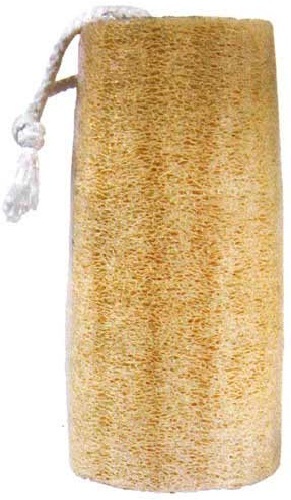 A loofah like this costs anywhere between INR 60 to INR 250 in the market, when you can easily get it for free. I am blessed to have grown up in completely natural surroundings, close to nature. 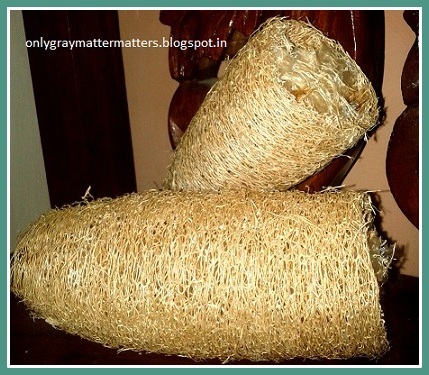 We used to use this loofah often during childhood. A few years ago, I was surprised to see it is beautified and sold in the market for a good price. 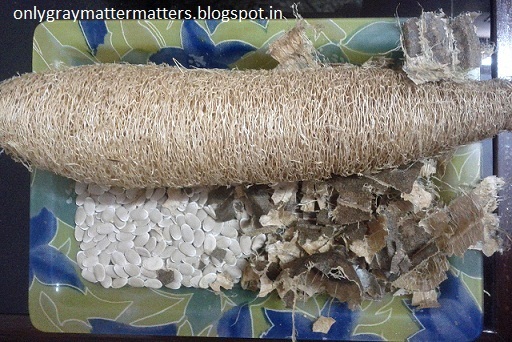 Natural Loofah, loofa or luffa is the fibre of dried bottle gourd. It grows on a vine and is easily available in many countries. 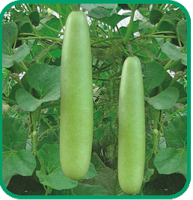 In India, it grows in abundance August onwards and is a winter vegetable. 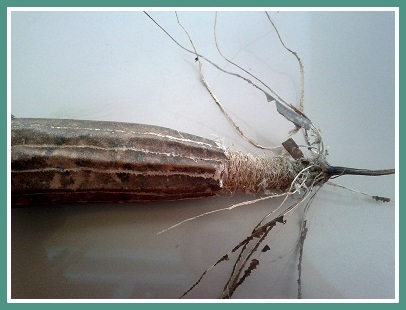 If you do not pluck it from the plant, the gourd dries on the vine and looks like this. Please note that the plucked bottle gourd bought from the market would NOT dry into this. It needs to dry naturally while hanging from the plant. When you remove the dried peel, you expose this beautiful golden natural loofah. It is modified into different shapes and the price increases accordingly. Here I cut it into two pieces simply using a pair of scissors. The bigger half is my loofah. You put a thread or ribbon through it and it looks like the first picture above. Make sure that the cut ends on both sides are not abrasive. It they are sharp, just rub them against a rough surface to smoothen the edges. Just wet it a little and scrub on the body after applying soap. Else pour your shower gel directly on the wet loofah and scrub. You need to dry it everyday else it will catch fungus and won't last long. If you can get your hands on it in a village/kitchen garden or anywhere else, make many loofahs and stock them. Replace whenever required. Now let's see what I did with the smaller half. Ta da, you can be creative and make many other things out of it. Varnish it. 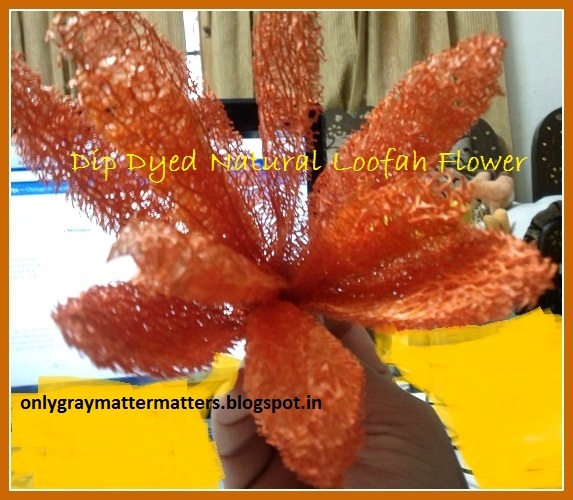 You can even dip-dye it in food color or cloth color and make colored flowers in a dry flower arrangement. I used to do that as a kid and they look really beautiful. You can turn it into powder using a mixer blender and keep in the bathroom. Just add to your shower gel when you want to use it as a body polish. 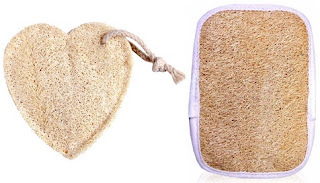 It is the same natural loofah power which is also used in The Body Shop body polish and other brands. I think it may be a little too abrasive to use on the face, so do NOT use in a face wash.
You can use it as a scrubber when washing utensils. 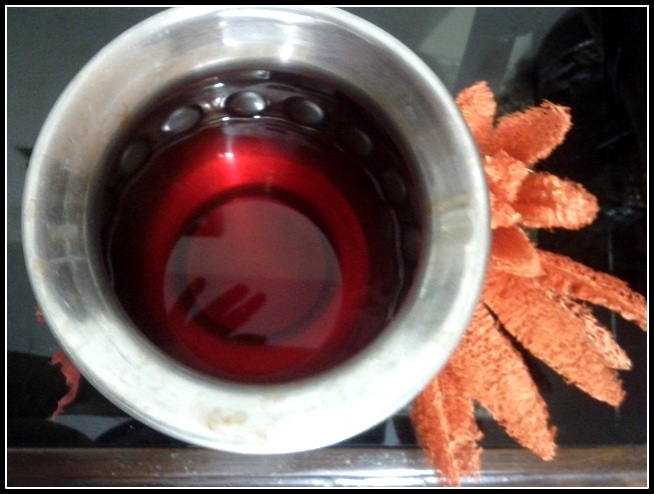 If you know soap making, turn it into a loofah soap :) See THIS interesting loofah soap-making article. Use it as a moss for small indoor creeper plants. Else tie many of these around a long rod and fix it into a pot for your money plant or other creepers to creep up. The ZINIO international giveaway is now closed and the winners have been announced on our Facebook Page. Thanks Avina :) I agree we miss out on a lot of things in big cities. For eg, Rainbows were so common at my place and when I saw a Rainbow for the first time in Delhi, I was soooo excited but the other Delhites were like they never noticed such things, because the concrete jungle does cut us off from the Nature. Yes, this should be easily available in villages or where they grow vegetables. wow gagan... sigh i live in a concrete jungle and will have to rely only on market loofahs..
:) I understand Supriya. I also missed out on certain things when I was in Delhi. Thanks for reading. :) Thanks Tejinder. So glad you liked it. I am sure you must have also seen these in Punjab. It was interesting to know that! Thanks for considering my opinion on this :) I just typed 'lip palette' on the BIC site and the 32 lip palette is available at 50% off. The 35 palette is at 20% off. So you can buy it now :) I haven't shopped from tinydeal. 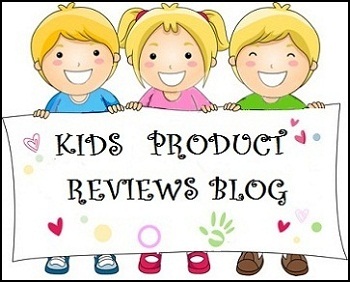 If the reviews are not good, skip it and I see the prices to be higher on tinydeal. Abt the palette, are you aware that the quantity is v v less and you may not be using all the colors, just take a look again. I would rather invest in 1-2 good quality lipsticks than those small button sized pots. Go for it only if you really really want it. You are right about that! the 32 palette is not worth it. The 66 lip palette is available fr around $6 only and there's also a 15 palette fr just $4 with a bigger pan size. I just want these for fun. there are times I want to apply a bold shade but I know I am never going to use up the entire tube. I rarely go till the end of a tube - unless its that one staple everyday shade. I end up throwing them out after 5-6 years. Ha ha thank you for the compliment :) I am glad it helped. Yes BIC site does not link all items properly under each category and I also discover a lot of stuff by search only. But at the HUGE level they operate the variety they house, it is not possible for them to keep updating the site so often especially when so many ppl are buying simultaneously. OMG. I love this article ... When I was young my mom and aunt used to make these and I have been looking for these from sooo many days ... awesome article .. Thank you Shweta and I can feel the excitement in your words :) These will be in our garden after Aug or so and if you want them, I would be happy to send you some. I like these better than the synthetic ones. Its such nice DIY tip. The soap looks so beautiful. I need to tell you, on medplus site, i bought a bathbrush ..its made of natural vetiver herb..its quite nice. please try when you get to see them..it costs 10 bucks only. Well, when you can get the loofah from your own garden, you donot need to buy this. 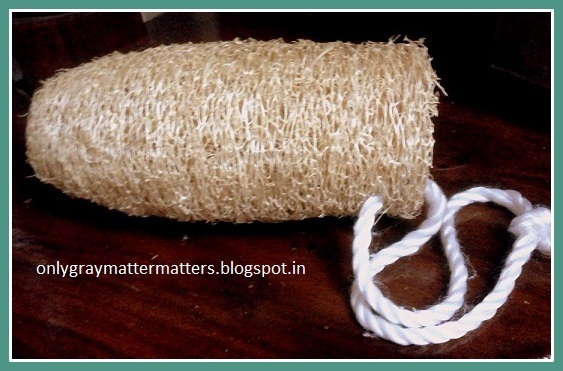 For people like me who dont have access to get this natural loofah, you can try this bath brush from Honey Ramacham. Wow. Thanks for letting me know about it. I tried looking for it on Medplus but couldn't find the one you mentioned. It shows one from Eco Essentials made from vetiver grass. Do send me picture if you can, or may be I will send you some when the season is back. We found 3 more dried gourds yesterday and made a few more. 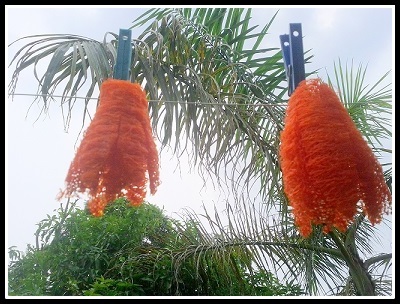 I am getting these loofas for Rs.5 here, as this is abundant here where we also grow these bottle guards in our farm for more than 19 years... We are using this for more than 15 years.. I was really shocked to hear that it was sold for Rs.60 and above..
Dear Nandhini, thanks for sharing that. You are right, this is a gift of Mother Nature like many other fabulous gifts. So glad to know you have seen these grow in your own farm and have enjoyed using it for so long. I try to show such things to my little one too so he cherishes it when he grows up :) With most places turning into concrete jungles, most city people are oblivious to these simple and amazing beautiful things. The place where I stay, we also get so many other things from trees and plants that you can make your own beautiful potpourri too. Dear Deepika, Gheeya is already in season and you are very likely to find a gheeya or tori vine around your place in the present weather till Dusshera. 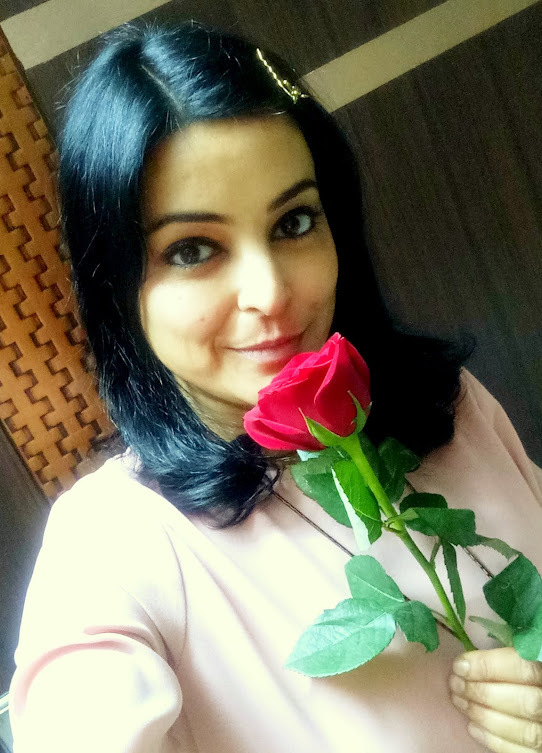 Do let me know if you find one, else I will send across when I get one this season :) Thank you so much for reading all my interesting posts and so happy to see that you are excited to try out the stuff I share. 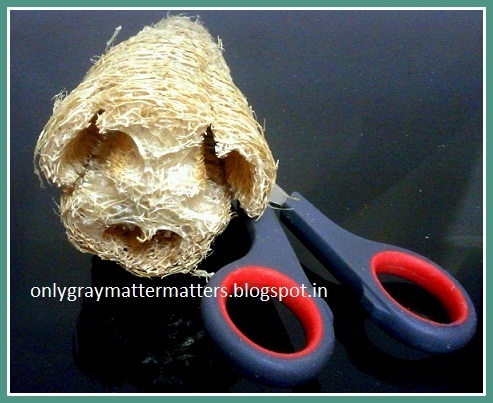 I've been knowing this since childhood that Gheeya turns into loofah after drying, but never tried getting one for myself ever. Even was not aware that it has to be there on the plant for drying procedure.. I'm all impressed by ur creativity dear..
Awww thank you so much dear. Actually it is in season right now so you can give it a try this year :) And hardly takes any time to clean up and make one. Plus it is fun. Besides what I have discussed above, you know, I came across a business named 'Oh Gourd' recently, that makes very creative and functional home decoration pieces and lighting using this. They cover glass bottles with dyed loofah layer and turn in into a lamp. When the light filters through the loofah veil, it creates a beautiful effect on the walls.